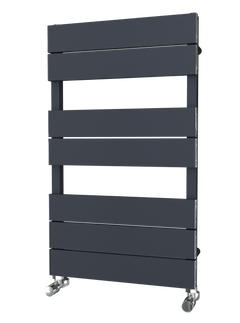 The Reina Diva Flat Black Towel Radiator is a black flat profiled ladder with a contemporary design which adds style and elegance, combined with practicality. The Diva has 25mm tubes, which are hand crafted from high grade steel, provide enhanced performance, look modern, and will keep the thickest towels nice and warm! The Reina Bonera Vertical Designer Radiator features a segmented panel design for an ultra modern looks and feel. The Reina Bonera is a stunning radiator and can be used to create a centre piece in any room. The Reina Victoria Traditional Towel Radiator is a traditionally designed classic. The look is becoming more and more popular, with the stunning looks complementing the heating performance. The Victoria is suitable for bathrooms and cloakrooms. High Quality Welding with 32mm Steel Tubes with Brass Ball Joints. The Reina Diva Flat Chrome Towel Radiator is a chrome flat profiled ladder with a contemporary design which adds style and elegance, combined with practicality. The Reina Diva Flat Towel Radiator is a white flat profiled ladder with a contemporary design which adds style and elegance, combined with practicality. The Reina Diva Curved Towel Radiator is a white curved profiled ladder with a contemporary design which adds style and elegance, combined with practicality. 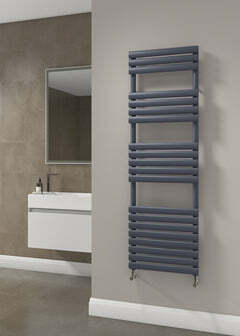 The Reina Flat Vertical Designer Radiator features a simple design, that would look great in any room or setting. The Flat is also available as a horizontal option. 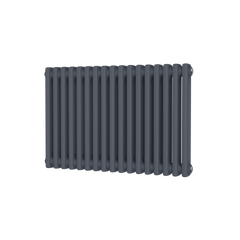 Please see Reina Flat Horizontal Designer Radiator. 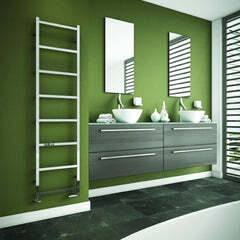 The Carisa Elite Aluminium Horizontal Radiator is an elegant design, that has clean lines and a fresh look. The Carisa Elite would be fantastic in any room, especially hallways, lounges, and bedrooms due to its classic design. The DQ Vulcano Vertical Designer Radiator - Dark Grey - Single Panel is a great looking radiator, which has the benefit of a unique shaped tube, which ensures it delivers great heat for its size. The DQ Vulcano would look amazing in any room in your home. It is available in a lot of size and colour options so should suit most applications. The DQ Vulcano is available in mild steel. The Radox Premier XL Curved has a greater curve radius which allows easier towel storage. Its 304 marine grade stainless bars are individually hand curved before assembly making the rail more appealing. The Premier XL Curved has a full complement of 22mm cross bars and 38mm collectors. The Premier XL Curved is lovely product and would look great in any bathroom. The Radox Premier XL Curved is made out of Polished Stainless Steel. The DQ Vulcano Horizontal Designer Radiator - White - Single is a great looking radiator, which has the benefit of a unique shaped tube, which ensures it delivers great heat for its size. The DQ Vulcano Horizontal Designer Radiator - Dark Grey - Single Panel - is a great looking radiator, which has the benefit of a unique shaped tube, which ensures it delivers great heat for its size.